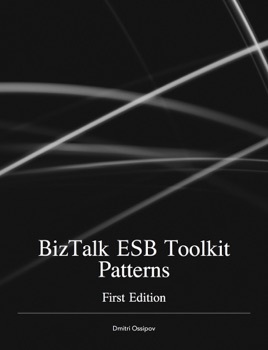 BizTalk ESB Toolkit Patterns book shows how to apply well known implementation, integration and service technology patterns. Written by architect who led development of the toolkit version 2.0, this book is for developers and architects who would like to gain in-depth knowledge about using capabilities and extensibility scenarios by applying patterns with recipes. The recipes included in this book illustrate how to apply given pattern to solve common and recurring integration challenges. This book covers 22 patterns and more than 30 recipes with code samples and step-by-step instructions to help you take advantage of features and capabilities included in the toolkit.